This classic Onion Tart is a bite sized blend of flaky puff pastry, caramelized shallots, goat cheese and pepper. It's an elegant yet easy appetizer for the holidays and can be made in a variety of shapes! In a saucepan over low heat, melt butter with shallots and brown sugar. Stir occasionally until tender - about 15 minutes. Meanwhile, roll out puff pastry on parchment paper with flour to a 9x13 rectangle. Transfer to baking sheet. Using a cookie cutter, cut out puff pastry shapes. Peel away excess dough. Top shapes with caramelized shallots, goat cheese and pepper. 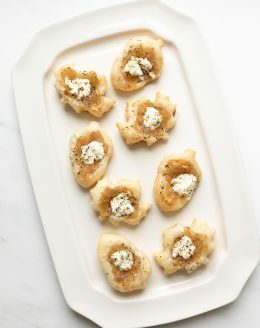 The easiest way to top with goat cheese is to allow it to soften while caramelizing the onions, then using a fork and dropping onto the pastry.